It's been a minute since June, and we've all felt the market cool a bit. However, June was hotter than July (possibly). 1. Inventory was still historically low, if flat month over month. 2. Closings were still historically high, if flat month over month. 3. Prices were WAY up in June. The average price for a 3 BR home went from about $173,000 to $199,000 year over year. 4. So far closings have closely tracked just above 2017. It will be interesting to see if we have that somewhat seasonal July dip and that HUGE August jump this year as well. Is this a seller's market or the new normal? I'm seriously starting to wonder. Inventory continues to be issue number 1. Only homes with major condition or location issues are not going into multiple offer as soon as they hit the market. Rates are remaining steady under 5%, meaning it is most likely still cheaper to buy than rent (if you can find a house to buy(. Prices are up across the board again, which is no surprise with buyers competing over almost every single listing. Appraisals are still not a lot of fun and are causing agents and sellers to practice holding their breath. Again, I say, is this the new normal? With more and more people moving to Knoxville and with our attractions and infrastructure growing, we may be getting some big city real estate problems. 2018 is starting off as a steady seller's market, but nothing is jumping off the charts just yet. Rates are rising slightly, but not alarmingly. Clam down. Multiple offers, backup offers, crazy offers: it's still the wild west out there, folks. Sellers still seem hesitant to jump in on this bizness, but I'm hoping that will change in the coming month, as Spring Selling Season is almost upon us. This is the first year in a while that I have ABSOLUTELY NO IDEA what to expect. Just stay tuned and let's enjoy the ride together, yes? Yes. *All information provided by KAAR (Knoxville Area Association of Realtors). My opinions are just that: opinions. I'm not really an expert in anything, but I do like to write about real estate. Nothing cooled down this winter, including the Greater Knoxville Area real estate market. The year ended on a great note in December, but let's take a look at how we're starting off 2017! Please to enjoy the following beautiful charts with data from the Knoxville Area Association of Realtors (nom de plume, KAAR). To the charts! Hey, girl, hey! Hey. Yeah, so... I'm a little behind on this here home sales stuff. And yeah, I'm kind of embarrassed about it. But the good news is this: I'm gonna catch you up in a jiffy! First let's take a look at the charts (with info courtesy of the Knoxville Area Association of Realtors, secret service code name, "KAAR." Ready? Set. Go! It's almost time to go back to school, but that doesn't mean that I'm finished schooling you on the Summer Selling Season. We're almost through July, so that means the June numbers are out, and they are HOT. How hot? Well, join me as we explore the Knoxville Home Sales Report numbers from the Knoxville Area Association of Realtors (aka KAAR), won't you? Whew, lawd! I'm not entirely sure what happened to the last two months, because all I've been doing is slingin' houses down in the real estate mine. And let me tell you, that mine is drying up, folks (can a mine dry up, I'm going to say yes). 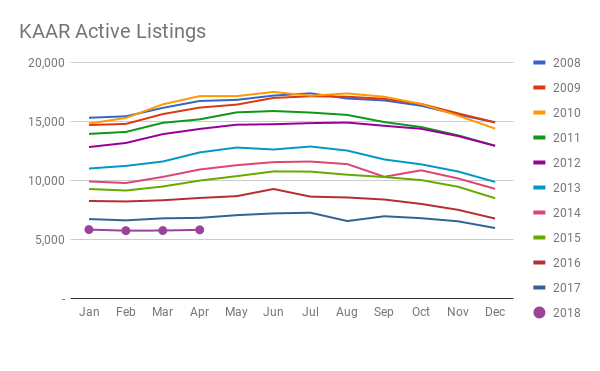 So to get caught up, let's cut the jibber jabber and take a jaunt through the April & May home sales numbers from the Knoxville Area Association of Realtors (miner nickname, KAAR). To the charts! Spring has sprung, and apparently those little buds were already hiding way back in February. Let's take a look back at the month that was to see what the home sales report numbers from the Knoxville Area Association of Realtors (pen name: KAAR) have in store for us. Come on! Hellooooo, 2016! My, you're looking fine! Inventory's low, sales are....well, you need to take a look a these charts for yourself and then read the breakdown of the Knoxville Area Association of Realtors (the artist formerly known as KAAR) January 2016 sales numbers for the greater Knoxville area. Go! Had you guys given up hope that I would ever post the April Home Sales numbers? Well, don't stop believin', you guys, because I would never let us go our separate ways without dropping this science from the Knoxville Agent Association of Realtors (album name, KAAR) April Home Sales numbers into your open arms! Let's go on a real estate "journey" of sorts," shall we? Hey, May! How you doin'? You sure are looking and feeling pretty good. And as much as I hate to think back on colder, less flowery months, it's time to take a look back at the month that was March. What for, you ask? Why to check out the March 2015 Home Sales Report numbers from the Knoxville Area Association of Realtors (chemical element symbol, KAAR). Let's spring right into it (see what I did there)! Wasn't nothin' lower than months of supply in March, y'all. Take a look at that royal blue dotted line that's taking a nose dive all the way down to March 2006 home inventory levels. 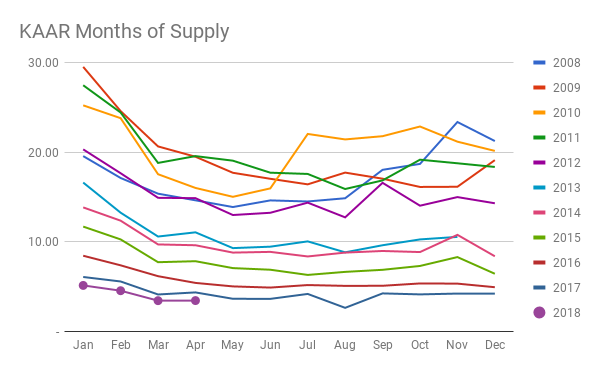 That's right, our months of supply (or the number of months it would take all current homes on the market to sell at the current rate of sales) is now down below 8 months. BELOW EIGHT MONTHS. That's the lowest it's been in pretty much forever, or at least in about 9 years. Stay tuned to the wrap up to see how this is affecting the market, because it is DEFINITELY affecting the market. It's a bird! It's a plane! Wait...is that...IT'S THE MARCH CLOSED SALES GOING THROUGH THE ROOF! Holy macaroni, you guys, talk about starting the Spring Selling Season off right! Sales in March 2015 were the highest they've been since 2007, AKA Ye Goode Olde Dayes. And that's the biggest March jump we've seen since 2006, AKA The Really Goode Olde Dayes. So how are all these sales affecting the market? I'll give you one guess and it's starts with a "P" (not pork chops, although they are delicious). Keep reading on down to the break down for the answer. Inventory - Greater Knoxville area housing supply is now officially the lowest we've seen in it 9 years. Pricing - Here's your big "P." Average and median sales were up all the way across the board in March. I belive the fancy explanation for this is "supply and demand." SALES! - Sales continue to be up year over year and month over month. With the activity I'm seeing in the market, I'm not thinking this is a one month thing, either. Rates - They're still below 4% and that's what's driving a lot of the above (sales). http://drunkjcrew.tumblr.com/ - Seriously, it's so funny. Listings - The good homes are selling about as fast as they're going on the market, ususally with multiple offers. Rentals - Everybody's trying to find a good rental (because there aren't any). Fence Sitting Buyers - Ain't nobody got time for that this spring. Sellers, are you thinking about selling your house? May I suggest right around NOW to be a good time?The tipping point into a Seller's market could easily come sometime this summer. COULD. Investors, why not take advantage of low rates to build a rental inventory? Renters need places to rent. I'm just sayin'. Agents, enjoy this market while it lasts. Trust me: I lived through 2008-2012. BOOM. And I stand by the fact that we still don't want prices to get too high (as much as sellers would love that). What we want, is to get back to a nice, heathly, even market. And I think we're just about there. Seriously. See you in the future! I hope I'm wearing my jet pack. All data taken from Knoxville Association of Realtors (KAAR). I promised you a Home Sales Report Blogging Bonanza and a Home Sales Report Blogging Bonanza is what you shall have. So, without further ado, let's take an icy dip into the December Home Sales Report numbers from the Knoxville Area Association of Realtors (you might also know them as "KAAR"). Ready, set, GO! It's January, you say? I say, OK, I can't deny that. I mean, there's the calendar on the wall. 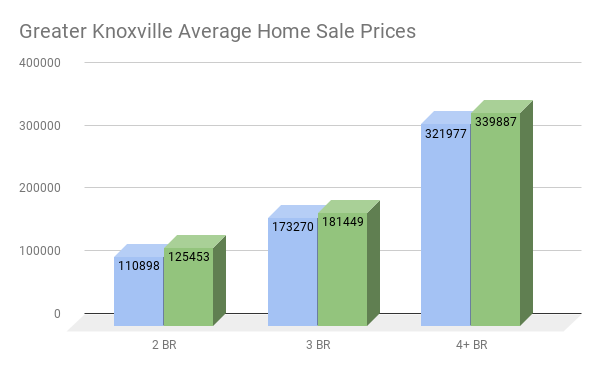 However, the November and December Knoxville Home Sales numbers from the Knoxville Area Association of Realtors (street name "KAAR") are just now out. So weird, it feels like I was just here writing about the September Home Sales Report number...oh wait, that's because I was. But we've got A LOT of catching up to do, so let's unwrap the Christmas gift that was the October Homes Report numbers from the Knoxville Area Association of Realtors (aka, Santa KAAR). To the charts! It's a Christmas miracle, friends: I'm baaa-aaack! And yes, opening a new real estate brokerage got me more than a little distracted, so I'm more than a WEE bit behind on these here home sales numbers. But even a journey of a thousand miles starts with a single step, so let's pick right up where we left off, shall we?